MAKE AMERICA WORK AGAIN DAY 2 - The opening speaker of the Republican National Convention kicked off the personal attacks against both Hillary and Bill Clinton. And as the night went on and a parade of speakers made their way to the stage, the attacks — on counts both personal and professional — kept coming. Republican National Committee Co-Chair Sharon Day said that Hillary Clinton "viciously attacked the character of women who were sexually abused at the hands of [her] husband." “Make America Work Again” will be Tuesday’s theme when the Republican National Convention enters its second day in Cleveland. 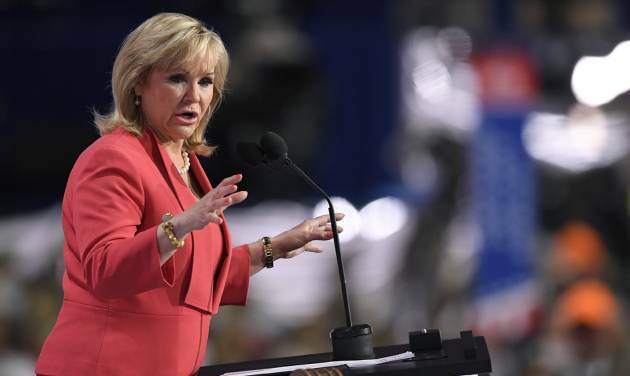 Speakers chosen for Tuesday are expected to talk about how to improve the U.S. economy. Presumptive GOP presidential nominee Trump is scheduled to speak on Thursday, the last day of the convention. Following in the Trump campaign’s “Make America Great Again” slogan. DAY 2 - Cleveland streets were full of life Tuesday, Day 2 of the RNC. There were police officers from Georgia. Mounted police and their beautiful horses stood majestically near Public Square. A talented musician made up songs for passersby. Visitors talked about issues — and their favorite candidates. There were heated protests on hot Public Square where scores of police officers kept the peace. And kids and cops shared a moment of friendship. DAY 2 - Radio host Alex Jones was attacked by Communist agitators outside the Republican National Convention Tuesday while leading a protest through Cleveland’s Public Square. 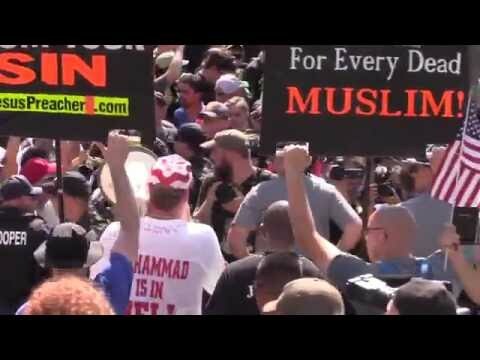 While using a bullhorn to denounce the divisive politics of the left, Jones was attacked by a group carrying red flags who were ironically chanting “Nazi scum.” An off-duty police officer named Kevin who witnessed the attack explained in detail both how it began and the local police’s response. “There was two gentlemen from the Communist Party that came in and basically attacked Alex,” he says, noting that he blocked one of the men from punching Jones as well. 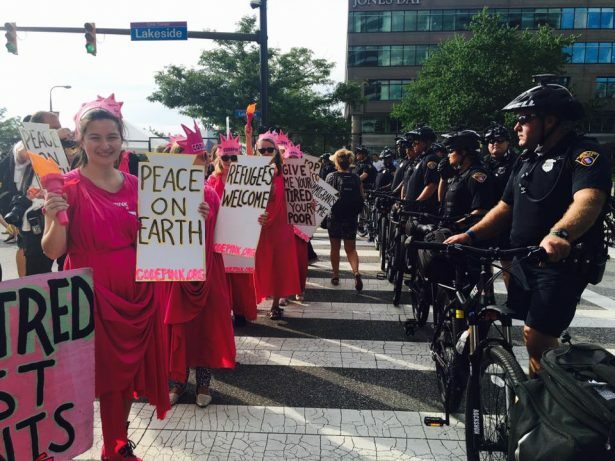 DAY 2 - A group called the Bible Believers marched down Euclid Avenue on Tuesday, July 19, 2016 before a short confrontation with people from the Westboro Baptist Church. 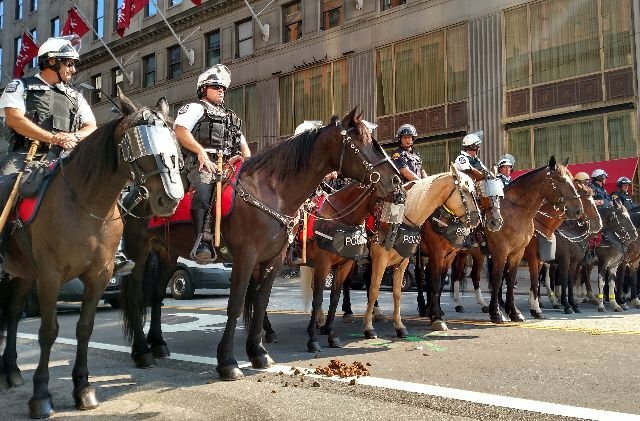 DAY 2 - Members of a western Ohio militia marched into downtown Cleveland for a second straight day carrying semi-automatic rifles to safeguard people, property and police during the 2016 Republican National Convention. "If the cops don't care for it, we will," said West Ohio Minutemen member Dan Stevenson. He and other members of the West Ohio Minutemen patrolled single-file around Public Square Tuesday, donning camouflage military fatigues, semi-automatic rifles and two-way radios. DAY 2 - The Westboro Baptist Church, the anti-gay religious group known for its protest of military funerals, made its first appearance at the Republican National Convention Tuesday at Public Square. Five members of the Kansas-based church were flanked by bike patrol police officers who stood between the church members and the small crowd that gathered. DAY 2 - A group of protestors from the Revolutionary Communists, protested outside the Q mid-morning. The protest moved along without incident under the watchful eye of several police officers. Some carried signs that said, "America was never great," in reference to Trump's slogan: Make America great again." The group also had signs referencing people killed by police.